In a 10″ skillet, saute the onions in olive oil until translucent. Add seasoning and salt (about 1/2 teaspoon) and stir well. Remove onions from pan; put them in a bowl. Add a little more oil and add the ground turkey, breaking it up between your fingers as you put it in the pan. Any seasoning left from the onions will be absorbed by the meat. Brown turkey and separate so it looks crumbly. When the meat is cooked, reduce heat to simmer. Add the onions back in and stir. Add black beans, stir. Add kidney beans, stir. Add tomatoes on top and cover. Cook about 10 minutes then add reserved tomato liquid (if you forgot and threw it away — don’t panic — you can use water or broth). Add as much liquid as you would like. 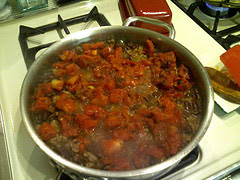 By this time, the tomatoes have expressed their juice so add as much or as little as you like. Simmer for about 10 minutes. Taste test and add salt if needed. Serve warm with whole grain bread.